How do network teams benefit from Observer Analyzer? From Apple Talk to VoIP, Analyzer delivers individual packets views and decodes over 740 primary protocols and countless sub-protocols. Reduce downtime and increase productivity with in-depth, contextual application analysis. Get response time data for thousands of applications plus performance metrics,transaction detail, and predictive analytics that show the network impact of new application deployments. Get immediate intelligence in both real time and post capture using Expert Events for TCP, UDP, VoIP, Wireless, and more. It tracks and organizes common services, flags response performance by severity, tracks port-based protocols for slow response, and differentiates between network and application problems with local traffic and WAN/Internet traffic distinction. Enhanced HTTP application monitoring offers deep insight into how web-based applications are operating, as well as how users are accessing IT resources, including browser type and operating system. 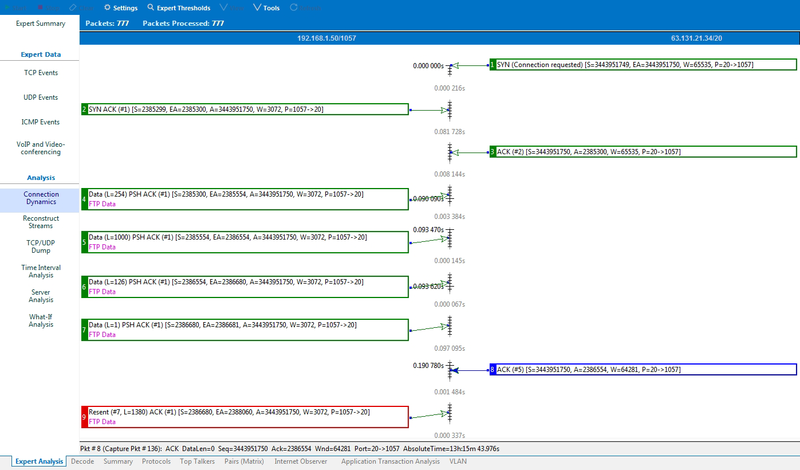 The only network analyzer that offers Connection Dynamics, it graphically breaks down individual network conversations piece-by-piece, pinpointing which request or response is causing the issue. Retransmissions and dropped packets are flagged for instant recognition of the issue source. Spaces between conversation sections identify latency and response time issues. TCP/UDP Expert Events show excessive retransmissions, and provide an explanation of the problem and possible causes. Use network trending to forecast IT needs or justify upgrades with comparative reports. View and analyze network traffic stats over periods of time — from days to years. Trending metrics can be broadly applied to meet diverse challenges like translating web traffic into Internet usage data to appropriately bill departments on service use. Perform in-depth troubleshooting with an interface that provides intuitive workflows for quick problem resolution. Deep drill-down capabilities with root-cause analysis pinpoint issues at the source with accuracy and ease. High-performance packet capture, decode, and filtering capabilities offer additional support. Analyzer deploys ongoing monitoring of activity levels and immediately sends prioritized alerts when network fluctuations cross your pre-set levels. It gives you the following alert options: emails, paging, trouble tickets, or kick starting an automated packet capture. Features also include flagging activities or errors from a pre-defined list; setting custom notifications based on any filter; obtaining email with virus information (including source and destination); and placing triggers on any WLAN activity. Analyzer's packet capture, decode, and filtering capabilities are second to none. It lets you view individual packets and decode for over 740 primary protocols and countless sub-protocols. Observer filters packets quickly and efficiently by address, address range, protocol offsets, and protocol presets using the intuitive GUI and by-command line. Enhanced HTTP application monitoring offers deep insight into how web-based applications are operating and how users are accessing IT resources, including information on browser type and operating system. Get in-depth support for the Microsoft UC platform. Obtain summary views of UC/VoIP metrics and qualify user experience on a per-call basis. In conjunction with tracking VoIP, teams can monitor Microsoft Lync server health by pairing Analyzer with Observer Infrastructure. Multiple tools to manage and investigate performance issues are no longer needed because Analyzer now has integrated support for third-party analysis and exporting captures for external analysis and security solutions. This means you can send captures to security devices, compliance and forensic tools, and other network analyzers. Observer Analyzer is part of the Observer Performance Management Platform where each product seamlessly works together to create IT management solutions for complex environments. It also connects with larger enterprise IT initiatives, including integration with IBM Tivoli and HP OpenView. Analyzer is often connected with GigaStor, and Apex to increase management performance power. Use Analyzer with GigaStor for long-term data capture and in-depth analysis on historical events. Analyzer is also used with GigaStor for forensics analysis and stream reconstruction. 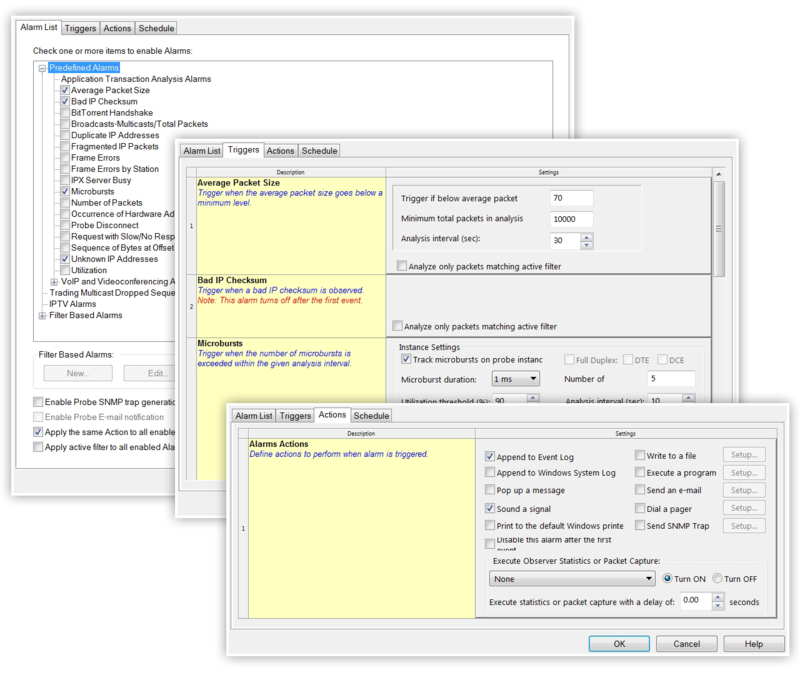 Analyzer pairs with Apex for high-level or aggregate reporting, enterprise-wide reporting, and global alerting. Observer Analyzer deployment is flexible, intuitive, and problem-free. 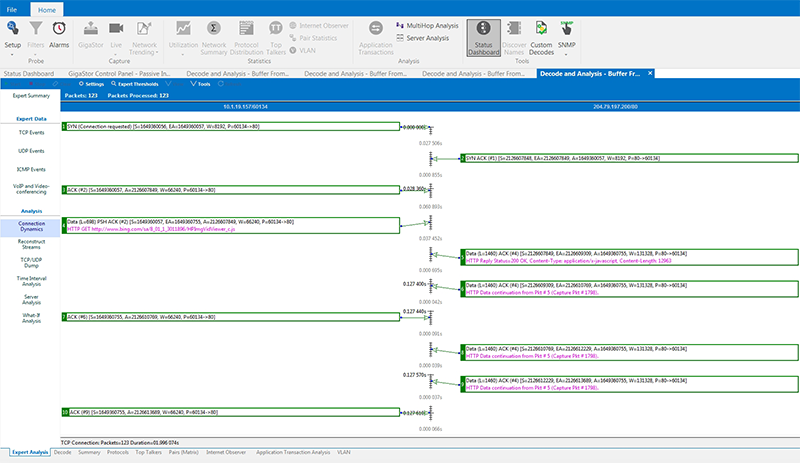 The Observer Analyzer software is most frequently deployed on a network engineer’s laptop and used for diverse purposes like connecting to Observer GigaStor and probes; acquiring data via local interfaces like wireless and Gigabit cards; and providing advanced Expert Analysis to packet captures acquired by third party devices. Additionally, some organizations may choose a centrally deployed Analyzer Suite for ongoing trending-data monitoring and analysis or the processing of alarms and alerts. Observer Analyzer offers three product options based on feature and functionality levels. 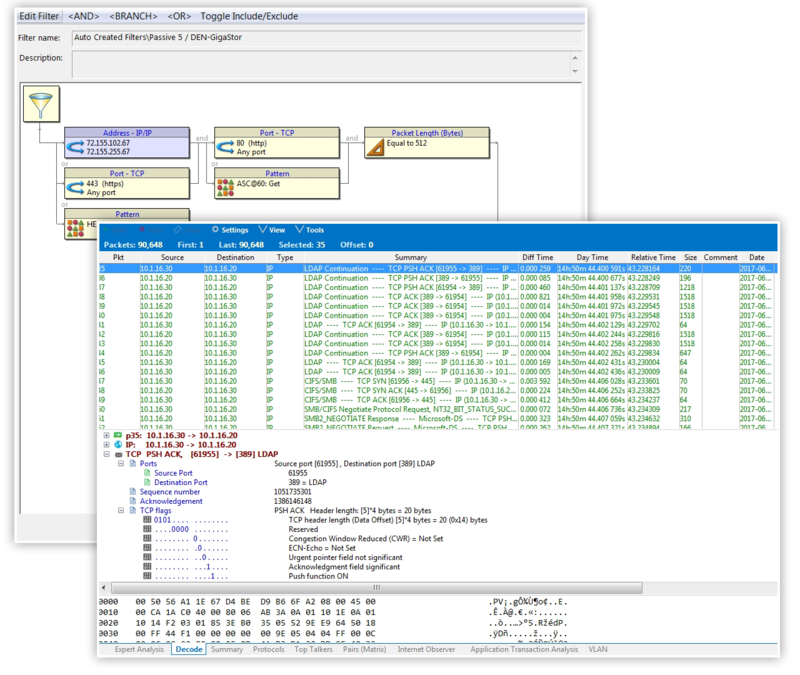 Observer Analyzer Standard Edition offers packet capture, decode, statistics, and more. Solve network issues through root-cause analysis, manage changes proactively through trigger and alarms, apply trending metrics for predictive planning, and more. Get deep and ongoing monitoring. Need a network troubleshooter with the speed and muscle complex applications demand? The integrated Expert Edition has every robust feature of Standard Edition with added power to pinpoint problems at the source, and automate the investigation and resolution processes. 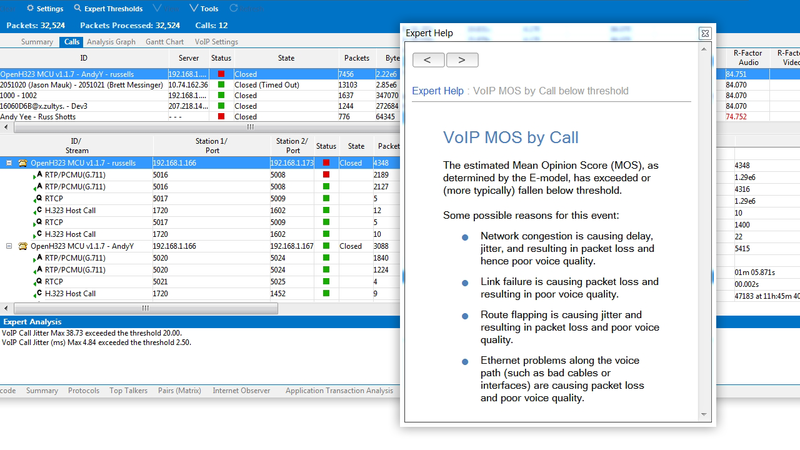 The Expert Analysis functionality provides the knowledge of 700 Expert Events that alert you to problems, with conversation analysis sections for TCP, UDP, ICMP, Voice and Video Conferencing, and Wireless. You also get Connection Dynamics for graphical conversation views right up to the application layer. Plus Application Performance Detail that places app issues in the context of its IT environment; and Stream Reconstruction, VoIP tools, and MultiHop Analysis. Use Expert Edition power to keep end-users satisfied and increase uptime. Our premium software console is packed with every feature the Standard Edition and Expert Edition offers, and then some. Suite is a web publishing service, stealth troubleshooter, and complex problem solver – with added bells and whistles to make network managers work smarter, not harder. It provides tools to generate and share customized reports on the web, with optional custom decode modules for proprietary use. Please review this link for information on minimum system requirements. Observer Analyzer actually makes you succeed faster.